Your bright and spacious holiday apartment is conveniently located in Nueva Andalucía, at the entrance to 'Golf Valley' and is equally suitable for a family, small group, or golf holiday. You are a short walk to the famous marina of Puerto Banus and there is a choice of shops and restaurants at your doorstep. The apartment has been recently decorated and furnished for the 2018 season and is equipped to meet your every need, including dual air conditioning in each bedroom, and in the lounge area also. There is satellite TV, including English language channels and a high speed WiFi internet service. 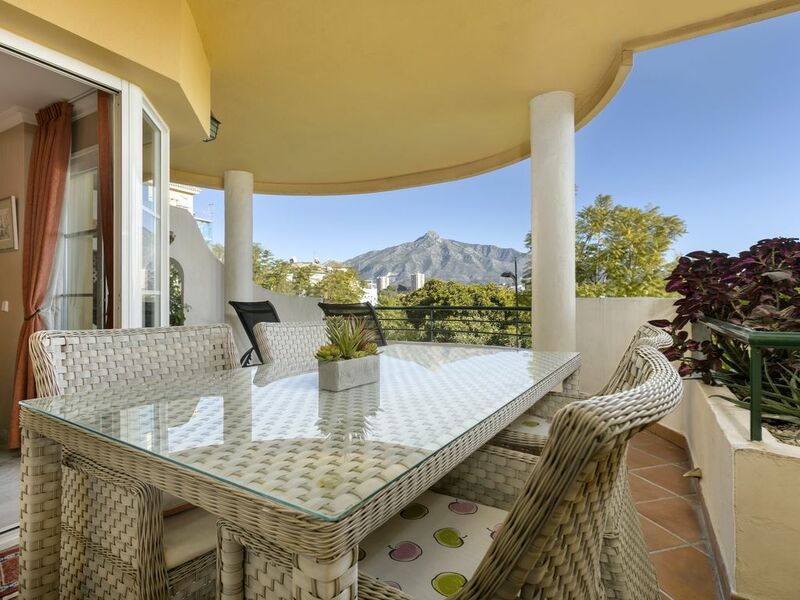 The Location: The apartment is conveniently located in Nueva Andalucía, less than one mile from the heart of cosmopolitan Puerto Banus and four miles from Marbella. Puerto Banus, famous for its yacht marina, exotic bars, restaurants and designer shops, also has excellent beach facilities. The area beside the Puerto Banus bull ring, which is a two minute walk from the apartment, hosts a very popular Saturday morning market. There are two supermarkets and a number of restaurants within five minutes walk. Very conveniently located, comfortable and fully equipped. The location, the views, the relaxed atmosphere. Each room has a heating and cooling air conditioning unit for your comfort and there are also oil filled radiators for the winter season. Each letting is fully provided with ample bed linen supplies and there are spare supplies if such are required. The dining area is furnished with a table and four chairs and is located between the kitchen and living areas. There is also a comfortable dining area on the front terrace with table and four chairs. The large front balcony is perfect for alfresco dining and is furnished with a high quality dining table and chairs, a 3 seater couch and table and also two recliners for sunbathing. There is a mountain bike in the store belonging to the apartment and it is available for client use by arrangement. There are 3 swimming pools in the complex, one of which is located immediately behind our apartment and is very easily accessed from the apartment. Just returned from six fabulous weeks in this lovely apartment. Everything you could possibly need is here. It’s clean and comfortable and in a great location with two supermarkets just a short walk in either direction. John and Olga are available for any questions and respond immediately. The large balcony gets the morning sun and the small patio off the master bedroom enjoys it in the afternoon. Can’t imagine anything better and certainly hope to return next year. Fantastic apartment in a lovely location. Thank Gerry again for allowing us to rent your amazing apartment, love the new shower room and the new out door furniture. Beautiful apartment, centrally located and child friendly. I stayed in Gerry’s apartment August 2018 with my husband and 3 young children, aged 8,6 and 3. We had a truly wonderful holiday. The apartment is equipped with everything you could possibly need for a young family.... including dishwasher and washing machine! There is air conditioning in all rooms and a great TV package for kids. The pool complex is brilliant - beautiful and clean and very well manicured. There are two large pools and two kiddy pools- all warm so the kids played for hours in them. Plenty of free sun loungers at the pool too. The beaches are great and only about a fifteen minute walk.... totally doable. There are 2 supermarkets within a 5 minute walk selling fairly priced produce. Would highly recommend a restaurant at the top of the hill called The View Terrace- breathtaking views, great food and again very child friendly! All in all if you want a great family holiday only 45 minutes drive from Malaga airport I would highly recommend this place. I’m sure we will be back! Thanks Gerry! Thank you Kirsty.I am thrilled to receive such a positive review and that it helped make a good holiday for you and your family. We had a lovely vacation at Gerry's apartment. Decorated to a high standard, nice pool, large balcony, great weather etc and within walking distance to the supermarkets (5 mins), and to the port (15 mins). Thank you Simon and I am pleased to hear that you had a good holiday and that the apartment met you and your family's requirements. Senorio De Aloha... what a perfect apartment for a family. The apartment was in the best location with bars and restaurants on your doorstep and supermarkets close by- supercor closing at 1am! The location was near to everything but still lovely and quiet. Close to Puerto Banus (15/20 mins walk or €5 in a taxi) Everything you needed was there. The apartment has everything you need, clean, modern and homely. Stunning views and the terrace is a good size. The swimming pool in June is quiet so you don’t have to rush to get the sun loungers. Beds were comfy and the shower is lovely and powerful. A lovely little Italian restaurant literally next door too! I am so pleased we found this apartment. This will defiantly be a regular apartment I will book when visiting my dad in Marbella. Thank you so much...See you soon! We are very pleased that the apartment met your requirements Emily and that you had a pleasant stay. Beautiful, clean & spacious apartment. Everything we needed. Short walk to supermarket, some lovely cafes and bars. Beautiful views. Great market on a Saturday morning, just down the road. Would definitely book again. Delighted to hear that all went well Jo and that you had a good holiday. Golf: You are located at the entrance to the area known as Golf Valley in Nueva Andalucía. It will take no longer than ten minutes to drive to any one of the nearby very popular courses of Aloha, Los Naranjos, La Quinta and Las Brisas. You are within a maximum one hour drive from another 25 quality courses stretching from Torrequebrada back towards Malaga, to Valderrama as you drive towards Gibraltar.